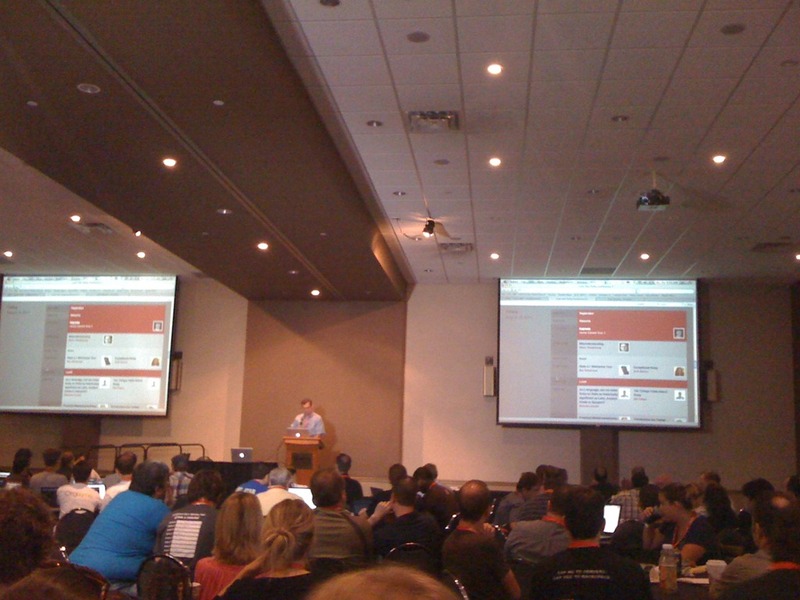 Last week I’ve attended to the Houston Code Camp 2011. Ben and the other guys did a great job at putting this sold out conference together, I’ve had lots of fun hanging with old and new buddies there, and attended to great sessions. I’ve recorded some of the sessions, and so did my buddy Alper. I’ve done some minimal editing to the videos and improved the audio a little bit, and uploaded it all for your learning pleasures. Enjoy! This last weekend I drove up to Austin for the Lone Star Ruby Conf 2011 (LSRC). This has been my first Ruby conference, and I was really looking forward to it. I’ve enjoyed the conference, and I’m likely to come back next year. Compared to overpriced conferences such as TechEd and PDC (now “BUILD”), paying $250 for the 2-day LSRC conference was not a problem. There are several conferences that are either free, or that just charge a very small fee, and I guess “free” is usually good, but I don’t mind paying 250 bucks for good content. It was also interesting that there was no “sponsors booth” (I think there was only one sponsor’s desk in there, and that was it). It made walking around the conference much better (it wasn’t crowded with booths and people). The keynote was not about pushing whatever “the latest integrated product that will solve the world’s hunger problem” down everybody’s throat. Instead, we heard about things such as the importance of testing, and when it may not make sense, bringing the “science” back to “computer science”, and being a culture that *reasons* together (well, that’s a very different tone from most conferences I’ve been to). In another note, we heard that “Agile hasn’t been proven to be the best way to do software, but it is the better way we know of today“. And the closing keynote was about serving customers. Great stuff! Not products… not languages… not geekness… just people! Yes, there’s a bigger reason why we write software: people! Chad Fowler‘s talk was really inspiring. As a presenter I’ve never liked the 45-minute session slots; it always feels like I can barely touch on the surface of whatever I’m presenting on. It’s been a while since I’ve actually sat through sessions, so it was good for me to get an idea of what it feels like to the attendee. Right now I have mixed feeling about session length. Depending on the session’s content and presenter’s style, 45 minutes seemed good enough for me, as an attendee, to get the gist of what the thing is all about, take some notes, and understand whether or not I want to look deeper into the topic on my own. In certain cases, 45 minutes seemed to short: when I was really grokking the topic, the session ended, and I’ve ended up with that “dang, gimme more of that!” feeling. I have to say that a couple of the sessions have flown way over my head, but I was kind of expecting that, given I’m new to most of this stuff. There were 260+ attendees. Two people have attended 5 years in a row, and the vast majority was there for the first time. CoffeeScript (default now). Ben mentioned the PeepCode video on it is really good. I definitely need to finish reading “the book” on it. I’ve been enjoying it, and what I’ve read so far has helped me keep up with a session on this subject. I had a note in my todo list to look into this tool for cross mobile device development, but I’m hearing lots of mixed feelings about it, so I’ll put it in the back burner until I heard a verdict from my buddies who are messing with it. Right after getting into Rails, I wondered whether it was a common to write something like ViewModels for the Views, and I was told that wasn’t the norm. There was this session where the speaker talked about this very concept. I need to look more into his work (the Draper gem), and the feedback he is getting from Rails developers. I’ll be delivering some courses at CODE Training in the next couple of months. Check out the ones you may be interested in and sign up! I’ll be doing a full 2-day Ruby on Rails for .NET Developers, as well as some training on WPF, and advanced .NET topics for VFP developers. I hope to see some of you there! Unit testing, Testing frameworks, Test Driven Development and Design and development considerations for testing. In this session, we break down the 5 principles of SOLID coding in terms of the code we’ve looked at this week and find out how these 5 principles can make you a better coder. Inversion of Control, Containers, Composition and more Dependency injection, inversion of control containers and using them to improve the use of composition in our applications, as well as our testability story. In addition to patterns like Model-View-ViewModel (MVVM) which we’ve already covered this week, we’ll look at how to recognize and implement other common patterns such as the factory, strategy, decorator, command, iterator, proxy and more, besides teaching Inversion of Control containers, as well as leveraging some C# features that facilitate the implementation of certain patterns. This session introduces the general concepts behind WPF and shows various examples that highlight the benefit of WPF over other UI approaches available. This session also introduces XAML (the markup language that drives most WPF and Silverlight UIs) and other core concepts. This session shows how to build user interfaces “the right way”. This session starts with an introduction of various WPF UI Design tools (including Visual Studio and Expression Blend). The session then guides the attendee from a simplistic and conventional UI approach (as it is used by other UI environments, such as WinForms or HTML) to a more modern approach that takes advantage of the WPF paradigm. This session continues the exploration of creating WPF UIs by taking a closer look at concepts such as data binding, automatic layout, view models, templates, and much more. This session discusses various topics that have gone unexplained so far, including deployment options. This session also takes a look at topics such as 3D, graphics acceleration, graphics rendering (vector art), animations, a closer look at resource management, and much more. Introducing general concepts for building business apps in WPF. This session provides a very brief review of WPF concepts and paradigms. However, the majority of this session is spent on creating a solution setup that works for real-world WPF projects. This includes not just the setup of the UI aspects, but also other elements such as view models and access to middle tiers or services. The session creates a real-world setup designed to accomodate business scenarios which involve typical data scenarios (handling of data in view models and also data binding in the UI). User interaction is discussed in detail as well. Should we start developing from the database up, or from the user interface down? In this session we’ll tackle that question, and present an approach that works well when building business applications. We’ll go over prototyping, writing presentation logic from a TDD (Test-Driven Development) angle, waiting until the last responsible moment to implement a database, etc. Rails enables developer to hit the ground running and create applications fast, even without knowing a lot of Rails or Ruby. We start the training by building a small application and get a quick feel for what’s coming. There are certain key aspects of Rails that developers need to know about, and this session covers most of them: Database Migrations, ActiveRecord, Routes, Models, Views, Controllers, etc. After having experienced some Rails, it’s time to start understanding the language we use to build our applications, which is the same that the framework is built on: Ruby. Here we go over the language’s main constructs, as well as some of the features that enables some of the Rails magic. There isn’t a single ultimate setup for Rails development that everybody uses. There are certain common core things that need to be installed, and certain tools that are more popular than others. Here we learn how to get the minimal environment setup, and what a couple of the options available are. The default view template system for Rails is Embedded Ruby (ERb). Other view engines can be used, though, and here we learn about one of them: Haml, which allows for cleaner views to be written. Besides supporting relational databases, Rails also work well with document databases. Here we learn about one of them, Mongodb, and how to use it in a Rails application. Rails has been built from the ground up with testability in mind. It’s easy to test the code you write, and it’s easy to write tests that use Rails elements. Here we learn how to write our first tests for a Rails application, using two of the most popular “gems”: RSpec and Cucumber. BDD is a development technique that improves the understand of the software being built by everybody involved. It improves planning of features and rids the project of unpleasant surprises due to erroneous expectations. Here we learn more about this practice and how certain tools used in Rails development can help us along the way. We’ve seen an application quickly built on Rails, and covered several core aspects, tools, and practices of Rails development. Here we bring all this knowledge together into building another application, applying everything we’ve learned so far, and introducing a couple more things, such as user authentication and authorization, deploying the application to the cloud, and more. A little over three years ago I wrote up my Learning in Spiral post.My recent move to a full time Ruby on Rails project got me to think over some of those things again. I’m always looking back to reflect on how I got to where I am the moment. I think about major road bumps, and how I got over them. My very first experience with software development was by creating a database in dBase III. That helped me understand spreadsheets, and next thing I know, I was writing some macros in Lotus 123 (so that was my first experience with writing code). I knew something about database and something about writing code, and got into Clipper. Smooth transition. Improved my knowledge of writing code by learning an xBase language (hadn’t done much actual coding in dBase). From there, to FoxPro: another xBase language, very similar to Clipper, and very similar database. Smooth transition. From there, to Visual FoxPro (VFP). Pretty much same language, same database, but with the added object-oriented features. This hybrid aspect of VFP was kind of interesting: a developer could write an entire procedural application in VFP, without using any of its object-oriented features. Smooth transition. VFP was also hybrid in regards to working with data. One could use xBase commands like in the old days, and/or VFP’s implementation of the Structured Query Language (SQL). So at first I’d only use the xBase commands, and eventually I learned SQL. 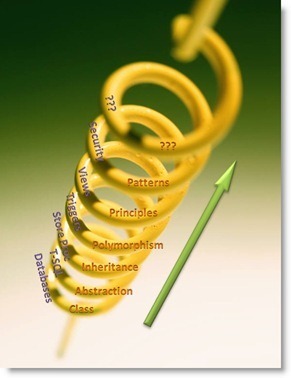 Then it was time to understand Object Oriented Programming (OOP), since VFP supported that. Learned a little bit on my own, and took a 1-week class where I’ve learned a lot more about code reuse through classes, inheritance, etc. That was huge for me at the time. Major road bump to go from my procedural world to the object-oriented one. With FoxPro being a dynamic language, I also did do some meta-programming with it; lots of dynamic execution of code based on things (include code fragments) stored in the database. Somewhere around that time, I looked into Visual Basic 3. The language wasn’t too different from xBase, certain things were similar to VFP regarding how to create the graphical user interface (GUI), but the thing didn’t have inheritance of implementation! Also, I had been building database-centric applications, and boy, doing data access in VB 3 sucked really bad! What was it at the time? Dynasets? Yuck. Gave up on VB real quick. The transition from using the powerful data language in VFP to the handicapped VB was too much for me to bear. Eventually I got into SQL Server (v6, I believe). I knew databases well at the time, but not a RDBMS. I did know the SQL language (from VFP), so the transition into SQL Server was relatively smooth (considering I didn’t need to do DBA-stuff such as heavy performance running, setting up security, etc.). At one point I *thought* I knew OOP well, then I started looking into Design Patterns, and realized there was a LOT I had to learn. At least at that point I was comfortable with the language, so I could focus on the patterns, architecture, and so on. There was something that I didn’t have a quite good grasp on, though: interfaces and delegates. You see, VB 3 (or 6… I did do some VB 6 at some point) didn’t have inheritance of “implementation”, but it did have inheritance of “interfaces”. VFP was the other way around (it had inheritance of implementation, but no interfaces). And as far as delegates, VFP didn’t have anything like it (and remember: I didn’t know any C-like language, so “function pointers” didn’t mean anything to me). One day C# gets features normally present in “functional” languages, in the shape of LINQ. Well, I had never even seen a functional language. At that point, LINQ just looked like the SQL implementation I had in VFP, and that was enough to get me started using it. After some more exploration, I started to learn more about the things that enabled LINQ: generics, lambdas, extension methods, type inference. To be honest, I don’t think I quite understand the math behind lambdas and all of that, but I guess I learned those things in C# well enough to make some good use out of it. Interesting transition from using LINQ thinking of it as “SQL for C#” to “oh, I think I’m getting this functional stuff now…”. Eventually C# then gets dynamic features. I used and abused of those features as soon as I got my hands on it. I figure how to do some interesting things with those features. Interesting transition back to the dynamic world I was used to in FoxPro. What other things did I learn while doing C#…? Hmm, SOLID. Unit testing and Test-Driven Development. Internal Domain Specific Languages (DSL’s) using extension methods… all those things only made more sense after I felt relatively comfortable with C#, though. Also, using dynamic features in C# has made me give even more importance to TDD. It’s good to reflect upon all of this and realize how much I’ve evolved transitioning from one language to another, always bringing something in the baggage throughout the journey and learning new things as I go. I have now officially started a blog series for RubySource. The first post came out today: Switching to Ruby From .NET! I’ll be posting there regularly every other week for several months. I’ll continue posting here to my personal blog, too. 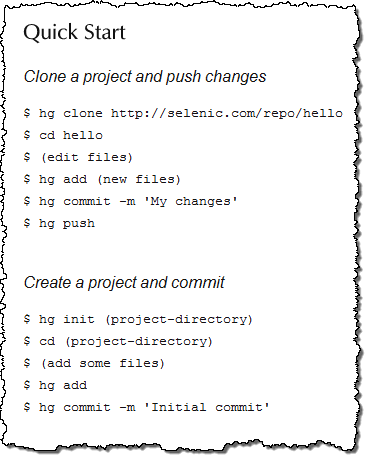 The main difference is that at RubySource each post will be more polished, and there’s also people editing it, whereas here on my blog it’ll continue to be a place where I dump ideas as I sketch them out. I hope to continue seeing you here, and start seeing you at RubySource as well!